Krwawienie do jamy otrzewnej z objawami wstrząsu hipowolemicznego u pacjentów z hemofilią A jest nieczęsto spotykanym stanem klinicznym. Praca prezentuje przypadek 14-letniego chłopca przyjętego do naszego ośrodka z ostrymi objawami bólowymi brzucha i cechami krwawienia do jamy otrzewnej. U pacjenta z rozpoznaną wcześniej łagodną postacią hemofilii A do tej pory nie występowały żadne epizody krwawień do jam ciała. Wykonane badania ultrasonograficzne i tomografia komputerowa jamy brzusznej wykazały obecność dużego krwiaka dwunastnicy oraz wolną krew w jamie otrzewnej. Po wstępnej stabilizacji hemodynamicznej pacjenta, wykonana kontrolna tomografia komputerowa jamy brzusznej wykazała zwiększenie objętości wolnej krwi w jamie otrzewnej, co wskazywało pośrednio na aktywne krwawienie. W trakcie wykonanej w trybie pilnym laparotomii ewakuowano z jamy otrzewnej 2000 ml krwi oraz stwierdzono obecność rozległego śródściennego krwiaka dwunastnicy, który opróżniono, a ścianę dwunastnicy zaopatrzono płatami Tachosilu (Nycomed®, Japan). Przebieg pooperacyjny był niepowikłany, bez objawów krwawienia do jamy otrzewnej. Wykonane kontrolne badanie rentgenowskie górnego odcinka przewodu pokarmowego wykazało jego prawidłową funkcję motoryczną. Obecnie pacjent pozostaje w kontroli ambulatoryjnej bez jakichkolwiek objawów krwawienia czy zaburzeń motoryki przewodu pokarmowego. Intra-abdominal bleeding with symptomatic haemorrhagic shock in patients with haemophilia A is a rare clinical condition. A 14-year-old male patient presented to the Emergency Department with abdominal pain and distension, with symptoms and signs of intra-abdominal haemorrhage. The patient suffered from a mild form of haemophilia A, so far without any bleeding complications. Ultrasound examination and computed tomography (CT) scan revealed the presence of a large retroperitoneal duodenal haematoma with a large amount of free blood in the peritoneal cavity. After initial haemodynamic stabilization, a repeat CT scan was performed, which revealed an increase of the blood volume in the peritoneal cavity and indicated the persistence of active bleeding. An emergency laparotomy revealed 2000 ml free blood in the abdominal cavity and a huge intramural duodenal haematoma. Duodenal haematoma was evacuated and the duodenal wall was secured by Tachosil (Nycomed®, Japan). The postoperative course was uneventful, without evidence of active bleeding. A control upper gastrointestinal contrast study showed normal duodenal motor function. The patient is now in ambulatory control, without any digestive or bleeding problems. Słowa kluczowe: śródścienny krwiak dwunastnicy, hemofilia A, wstrząs hipowolemiczny. Key words: intramural duodenal haematoma (IDH), haemophilia A, hypovolemic shock. Haemophilia A is an inherited disorder characterized by a defect in blood clotting due to varying degrees of factor VIII deficiency. Bleeding complications occur in 2-14% of patients, and lead to 18% mortality (1). The most serious bleeding complications are located within the central nervous system (CNS) and abdominal organs. Bleeding into the abdominal cavity is mainly from parenchymal organs (spleen, liver, and kidneys) and the retroperitoneal space, and is much less in individual sections of the alimentary tract. The most common site of bleeding is the duodenum (2), where the morphologically dominant form is intramural duodenal haematoma (IDH). IDH usually occurs with symptoms of subacute high intestinal obstruction and mileage, with signs of a severe haemorrhagic shock being very rare (3, 4). A 14-year-old male patient with haemophilia A had been effectively controlled on an outpatient basis, without any bleeding complications until admission. On admission, the patient presented with severe general condition, with symptoms and signs of hypovolemic shock and significant peritoneal symptoms over the entire surface of a distended abdominal cavity. The history of blunt trauma of the abdomen was negative. An intense anti-shock procedure was implemented, along with a diagnostic procedure. Initial laboratory tests showed: HT – 27.4%; RBC-3 160 000/ul; PLT – 263 000/μl; factor VIII level – 79%; protein C – 67%; APTT – 44.6 s and INR-1.3. Acid-base balance showed features of metabolic acidosis. The CT contrast scan (fig. 1) showed a large retroperitoneal haematoma, blurred and demarcated, located mainly at the duodenum level, of 58 mm thickness, spreading toward the right side, and about 55 HU. In addition, a large amount of free fluid was present in all quadrants in the peritoneal cavity, without any signs of active bleeding (fig. 2). Fig. 1. Computed tomography scan of a 14-year-old boy, showing an intramural duodenal haematoma (indicated by an asterisk). Fig. 2. Computed tomography scan of a 14-year-old boy, showing free blood in the peritoneal cavity. Transfusion of red blood cell, fresh frozen plasma, and factor VIII concentrate stabilized the patient’s vital signs but a repeat CT scan revealed an increase in the free volume of fluid in the peritoneal cavity, indicating active bleeding. Endoscopic investigation was performed just before surgery and excluded bleeding into the gastrointestinal tract. Surgery revealed about 2000 ml of free blood, with no signs of active bleeding. In the course of further exploration, the presence of a large retroperitoneal haematoma was found. The main mass was located in the vicinity of the duodenum. The dehiscence of the peritoneum with organized cloth was localized laterally to the duodenum, indicating a source of bleeding in the peritoneal cavity. After the release of the duodenum by Kocher’s manoeuvre, an extensive intramural haematoma (500 ml volume) covering the back and side walls of the second and third parts of the duodenum was evacuated. No signs of intestinal perforation or obstruction disability were visualized. Gas distension of the duodenum by nasogastric tube excluded perforation. The duodenal wall was secured with Tachosil (Nycomed®) patches. The peritoneal cavity was drained with two drains. The postoperative course was uneventful, with stable values of haemoglobin in consecutive samples. Drains were removed on the 7th day. The wound healed by first intention. The control CT study showed no pathological changes in the upper floor of the abdominal cavity (fig. 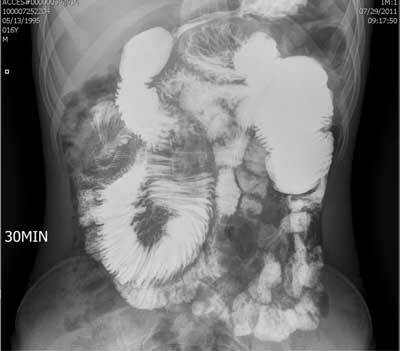 3), and abdominal X-ray contrast study of the alimentary tract revealed normal passage through the duodenum (fig. 4). The patient was discharged 24 days after surgery in good general condition, without any abnormalities in laboratory tests or imaging, and had a further examination on an outpatient basis. Fig. 3. Normal postoperative control computed tomography scan. Fig. 4. X-ray gastrointestinal contrast study. IDH (intramural duodenal haematoma) is a rare condition. The duodenal serosa does not cover the full circumference and does not prevent the growth of haematomas (5). Blunt trauma of the abdomen, pancreatitis, and duodenal biopsy are the most often reported causes of IDH. In most cases, spontaneous IDH is connected with coagulation disorders where haemophilic patients are an at-risk group. Most of these patients fail to demonstrate clearly defined causal factors such as trauma or surgery. IDH with signs of hypovolemic shock and acute abdominal symptoms is unusual and is considered a rare clinical entity. Isolated duodenal haematoma usually resolves within 7 to 10 days and nonoperative treatment has been advocated since the 1970s (6). The rich blood supply of the duodenum helps in the rapid dissolution of a haematoma and safeguards against development of stenosis and scarring. Indications for surgery are growth of the haematoma, perforation of the haematoma into the alimentary tract or peritoneal cavity, and no resolution of symptoms after 2 weeks of conservative management (7). In the present case, we observed perforation of a duodenal haematoma into the peritoneal cavity, with the signs and symptoms of haemorrhagic shock. In this situation, the indication for surgery was very clear. Stabilization of the patient allowed us to eliminate bleeding to the alimentary tract and preparation the haemophilic patient for operation with high doses of factor VIII. We did not expect any vigorous bleeding during the operation because bleeding from intramural vessels is usually self-limiting. The wall of the extraperitoneal part of the duodenum is very thin and during haematoma evacuation, microperforation should be excluded. The second important part of the operation was protection of the duodenal wall from persistent seeping of blood from small vessels. Location of the bleeding site was very difficult and the application of a coagulation device was very limited. We protected the extraperitoneal wall of the duodenum with Tachosil (Nycomed®) patches, which are a very effective agent in such a situation. An alternative method is to use glue but in our case, it was not necessary. In the postoperative course, the patient was closely observed in terms of recurrent bleeding and duodenal perforation, but control studies excluded these complications. Another important factor was cooperation with a haematologist and close monitoring of coagulation factors, with intense supplementation for any deficiencies. The present case is a rare example of clinical emergency in the group of patients with haematological disorders that needs vigorous preoperative treatment and life-saving emergency surgical procedures. The presented boy with haemophilia A and a large intramural duodenal haematoma with symptoms of hypovolemic shock is a rare coincidence of these clinical conditions. In the described patient, an important part of the therapeutic decision was surgery after initial haemodynamic stabilization and alignment of abnormalities in the blood coagulation system. 1. Brown D: Congenital bleeding disorders. Curr Probl Pediatr Adolesc Health Care 2005: 35: 38-62. 2. Janic D, Smoljanic Z: Ruptured intramural intestinal hematoma in an adolescent patient with severe hemophilia A. Int J Hematol 2009: 89: 201-203. 3. McDonald G, Kalapesi Z: Intramural duodenal haematoma in a haemophiliac. Ir J Med Sci 1975: 144: 72-74. 4. Kahn A, Vandenbogaert N: Intramural hematoma of the alimentary tract in two hemophilic children. Helv Paediatr Acta 1977: 31: 503-507. 5. Jones W, Hardin W: Intramural hematoma of the duodenum. Ann Surg 1971: 4: 534-544. 6. Fullen W, Selle J: Intramural duodenal hematoma. Ann Surg 1974: 5: 549-555. 7. Noguès A, Eizaguirre I: Giant spontaneous duodenal hematoma in hemophilia A. J Ped Surg 1989: 24: 406-408.